With this background, the present study was carried out to analyze the pattern of expression of hormone receptor estrogen receptor (ER), progesterone receptor (PR), and Her-2/neu in invasive breast carcinoma among the patients of different age groups, parity, reproductive status, etc., in our setting, a rural area of North-West India. Himachal Pradesh is a predominantly mountainous state in North-West of India. It stretches from 32°22'-33°12'N and 75°45'-79°04'E covering an area of 56,090 km3. The state has around 90% rural population and has the distinction of having a robust government health-care system. The state of Himachal Pradesh has only two tertiary care hospitals offering specialist care in Radiotherapy. One of these, where this study was conducted, is a government medical college in a rural area catering to six feeding districts, which accounts for almost a 50% of total population of 6.8 million. A hospital-based register was established to maintain record of patients with invasive breast cancer referred to the department of radiotherapy. The demographic and clinical variables including age, history, menstrual status, and clinical staging relating to patients were entered in the register after eliciting on the same from the patients as per a structured pro forma at the time of registering them. Prospective data collection was not carried out. The pathological variables included tumor type, presence of ductal carcinoma in situ, lymphovascular invasion, and expression of ER, PR, and HER2/neu as determined by immunohistochemical staining using standard techniques. Those patients who were detected 2+ on immunohistochemical staining were further advised for fluorescent in situ hybridization (FISH) test for HER2/neu amplification. Any ambiguity in the report was resolved through discussion with the pathologists. Modified Bloom–Richardson–Elston grading system (also called the Nottingham system) was used for the classification of breast cancer. The data were entered into MS Office Excel 2007 and were expressed in percentages. The Chi-square test was used to test statistical significance in case of categorical variables. 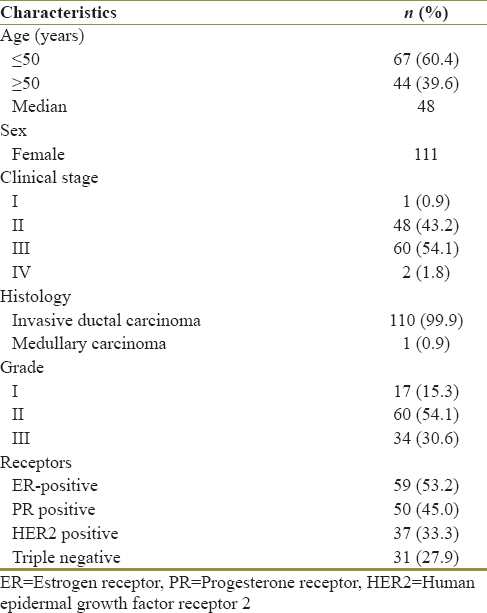 A total of 111 patients with invasive breast carcinoma were reported in our department during this period. The baseline characteristics of patients are shown in [Table 1]. Age of the patients ranged from 30 to 74 years with median age of 48 years. Most common age group was 41–50 (33% cases). Majority of the patients belonged to 40 years and above age group. Approximately half of the patients were postmenopausal (n = 58, 52.2%) and left side breast carcinoma was more common (n = 60, 54.1%). Majority of the cases were invasive ductal carcinoma NOS with only one case diagnosed as medullary carcinoma. According to Modified Bloom Richardson Grading System, most of the cases belonged to Grade II (n = 60, 54.1%) followed by Grade III (n = 34, 30.6%). Stage grouping of all the patients was done according to American Joint Committee on Cancer manual 2010 (7th Edition). Out of 111 patients, 60 (54.1%) and 48 (43.2%) were found in Stage III and II, respectively. Immunohistochemistry/FISH was done for all patients and observed that ER positive, PR positive, HER2/neu positive, and triple-negative patients were 59 (53.2%), 50 (45.0%), 37 (33.3%), and 31 (27.9%), respectively, as shown in [Table 2]. It was also observed that, for older patients (>50 years), the ER, PR, and HER2/neu positivity was higher as compared to younger age group, while triple negativity was higher in younger age group as compared to older age group. We also evaluate the menstrual status of patients with receptors [Table 3]. Postmenopausal and Premenopausal compared and the rate of ER, PR, and HER2/neu positivity was 58.6% versus 47.2%, 44.8% versus 45.3%, and 32.8% versus 34.0%, respectively. The present study comprised of 111 cases of invasive breast cancer and was used to analyze the receptor expression profile in the tumors diagnosed at a tertiary care center in rural area of North-West India. All the patients were from rural background. In this study, median age of patients was 48 years and disease peaked at 40–50 years which were similar to the study conducted in the other parts of India. It points to the fact that the disease affects younger age group as comparison to Western women almost decade earlier., According to National Program of Cancer Registry of Indian Council Medical Research highlighted the data from Delhi during 2001–2003 showed that, among 3777 cases of breast cancer, 44.6% cases were <54 years of age. Goel et al. and Saxena et al. have also reported similar results which further reinforce the fact that there is a rising incidence of breast cancer in younger age groups in the urban population in India., Probably because the cancers in the young tend to be more aggressive, they attract attention more easily than less aggressive cancers happening in older age. It also could be because older patients lack of awareness and have poorer access to health care in comparison to younger patients. Staging of breast cancer plays a very important role in estimating the prognosis of disease, treatment planning strategy as well as interpretation and comparison of the outcome of the disease. In our series, 48 (43.2%) patients had Stage II and 60 (54.1%) patients had Stage III disease. This is in contrast to that reported in studies from developed countries. In a study by Kamperman et al., 58% of patients with early breast cancer had Stage I and 33% had Stage II disease. Mansfield et al. and Jacobson et al. with 60% and 52% patients with Stage I disease, respectively, also reported similar results. In most of the developed countries, the use of routine screening mammography has led to the detection of very early reason. As mammography facilities are not widely available here and there is no nationwide breast screening program, most of the cases in our setup are present in advanced stages of the disease. Three molecular biomarkers are used in the routine management of breast cancer; these are ER, PR, and HER2/neu. ER is a nuclear transcription factor that when activated by estrogen stimulates the growth of normal breast epithelial cells. Proliferation may also be activated in the cells of invasive breast carcinoma expressing ER which is detrimental. Present studies showed 59 (53.2%) of cases with ER status positive, while 50 (45.0%) PR-positive status which is less as compared to approximately 70%–75% in the west., The trend for receptor expression in our data shows that ER and PR expressions gradually increase with increasing age. Simultaneously, triple-negative breast cancer was found in 31 (27.9%) of cases, and simultaneously HER2/neu-positive breast cancer occurred in 22 (32.8%) cases. The expression of HER2/neu-positive and triple-negative phenotype decreases with advancing age because of small numbers they are not statistically significant. Importantly, as per our study, IDC-NOS was diagnosed in almost all cases of breast carcinomas (99%). Only one case of medullary carcinoma of breast was encountered among the total cases studied. Comparing the statistics of Western countries, our studies show that we had infiltrating ductal carcinoma NOS as the most common breast cancer. Majority of the patients were detected in Stage II and III, unlike the Western studies where the patients are detected in Stage 1 also. Patients (>50 years) showed higher positivity of ER/PR/HER2 as compared to younger age group, while triple negativity was higher in younger age group. All primary invasive breast carcinomas should be tested for ER/PR/Her-2. Since ER/PR/Her2 status will change in a small percentage of breast recurrences, these markers should generally be reevaluated in recurrences/metastases. Endocrine therapy is highly effective and relatively nontoxic. For the practicing clinician, especially those residing in countries with limited or stressed health-care budgets, use of ER, PR, and HER2 is a valuable simple, inexpensive, easy to interpret, reliable, reproducible, readily available and acceptable way to subtype breast cancer. We acknowledge the shortcomings/limitations of this study is being a retrospective, single center and based on smaller sample size. Breast Cancer: Breast Cancer in Young Women. Available from: https://www.webmd.com'BreastCancer. [Last accessed on 2017 Dec 30]. Miller BA, Hankey BF, Thomas TL. Impact of sociodemographic factors, hormone receptor status, and tumor grade on ethnic differences in tumor stage and size for breast cancer in US women. Am J Epidemiol 2002;155:534-45. 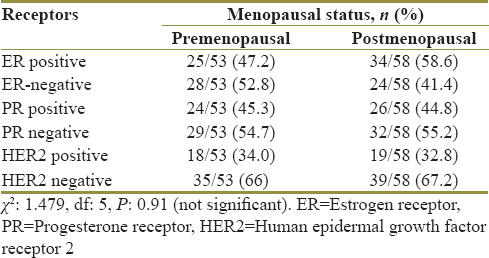 Sughayer MA, Al-Khawaja MM, Massarweh S, Al-Masri M. Prevalence of hormone receptors and HER2/neu in breast cancer cases in Jordan. Pathol Oncol Res 2006;12:83-6. Raina SK, Raina S, Chander V, Grover A, Singh S, Bhardwaj A, et al. Is dementia differentially distributed? A study on the prevalence of dementia in migrant, urban, rural, and tribal elderly population of Himalayan region in Northern India. N Am J Med Sci 2014;6:172-7. Genestie C, Zafrani B, Asselain B, Fourquet A, Rozan S, Validire P, et al. Comparison of the prognostic value of scarff-bloom-richardson and Nottingham histological grades in a series of 825 cases of breast cancer: Major importance of the mitotic count as a component of both grading systems. Anticancer Res 1998;18:571-6. Murthy NS, Agarwal UK, Chaudhry K, Saxena S. A study on time trends in incidence of breast cancer – Indian scenario. Eur J Cancer Care (Engl) 2007;16:185-6. Chopra B, Kaur V, Singh K, Verma M, Singh S, Singh A. Age shift: Breast cancer is occurring in younger age groups – Is it true? Clin Cancer Investig J 2014;3:526-9. National Cancer Registry Program (ICMR). Consolidated Report of Population Based Cancer Registries 2001-2004. Individ Regist Data; 2001-2003. p. 161. Saxena S, Rekhi B, Bansal A, Bagga A, Chintamani, Murthy NS, et al. Clinico-morphological patterns of breast cancer including family history in a New Delhi hospital, India – A cross-sectional study. World J Surg Oncol 2005;3:67. Kamperman H, Borger J, Hart A, Peterse H, Bartelink H. Prognostic factors for survival after breast conserving theraphy for stage I and II breast cancer. The role of local recurrence. Eur J Cancer 1995;31A: 690-8. Mansfield CM, Komarnicky LT, Schwartz GF, Rosenberg AL, Krishnan L, Jewell WR, et al. Ten-year results in 1070 patients with stages I and II breast cancer treated by conservative surgery and radiation therapy. Cancer 1995;75:2328-36. Jacobson JA, Danforth DN, Cowan KH, d'Angelo T, Steinberg SM, Pierce L, et al. Ten-year results of a comparison of conservation with mastectomy in the treatment of stage I and II breast cancer. N Engl J Med 1995;332:907-11. Antalio AA, Eugler JM. Breast cancer subtype based on ER/PR and her 2 neu expression. Clin Med Res 2009;7:4-13.